Dec. 5, 2018: Heather and Maizie are a darling duo who live by the motto "pet, purr, play, repeat." 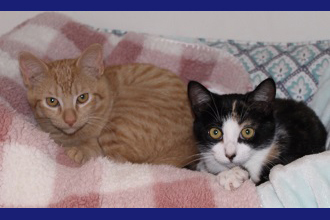 Heather (orange) and Maizie (calico) are six-month-old sisters who love to sleep, eat, and play together and are equally happy when adding a human into their mix of activities. Heather can catch a ball in midair and Maizie loves to help her foster mom tap on the iPad. A laser pointer is a favorite of both. They love to sleep in bed with the foster family's eight-year-old son and will spend hours on your lap in exchange for a few yummy treats. Heather and Maizie are ready and waiting for their forever home. This charming pair will make your family complete and keep you smiling all day long. 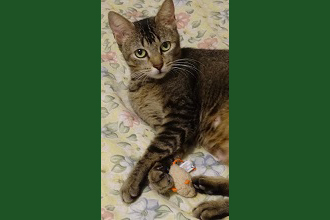 They are both in excellent health, spayed, microchipped, litter-box trained, and up to date with all vaccinations. The donation for each of the two kittens is $100. To meet Heather and Maizie, please contact Pet Rescue at 914-835-4133 or visit www.ny-petrescue.org.